This collection consists of the records of Bobbie Green from her time in the First Lady’s Office. Greene was Deputy Assistant to the President and Deputy Chief of Staff to the First Lady from August 1997 to October 1998. This series highlights topics relating to Save America’s Treasures, the preservation of the White House, National Endowment for the Arts, the President’s Committee on the Arts and the Humanities, First Lady’s Office staffing, Christmas, child care, health care, women, the White House Sculpture Garden, records management, Presidential Libraries, and the early planning stages of the William J. Clinton Presidential Library. 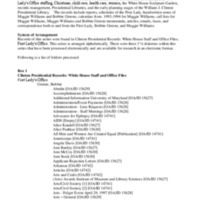 The records include reports, schedules of the First Lady, handwritten notes of Maggie Williams and Bobbie Greene, Maggie William calendars from 1993-1994, Maggie William call lists, Bobbie Greene and Maggie Williams memoranda, articles, emails, faxes, and correspondence both to and from the First Lady, Bobbie Greene, and Maggie Williams.